2 doesn't have to be your best shooter but has to be someone that will draw the defense out. 3 has to be your best scoring option. 5 is your best shooter. 2 sprints out to corner. We teach to turn and seal before sprinting. This keeps the defense off the pass. 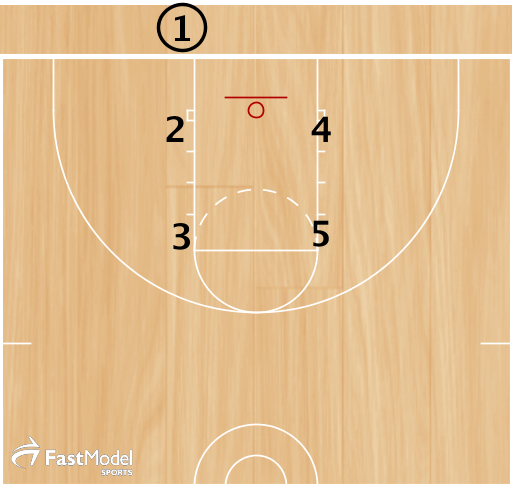 3 turns and screens for a tight curl by 5 and to receive the screen from 4. Vs a Zone Defense, we run the same set but change 3 movements. 2 sprints to the corner. 3 sprints down the lane line. "Coaching Point" -The Pass has to be made to his outside hand (left on this side). 5 sprints out to the wing for the shot. 4 seals.